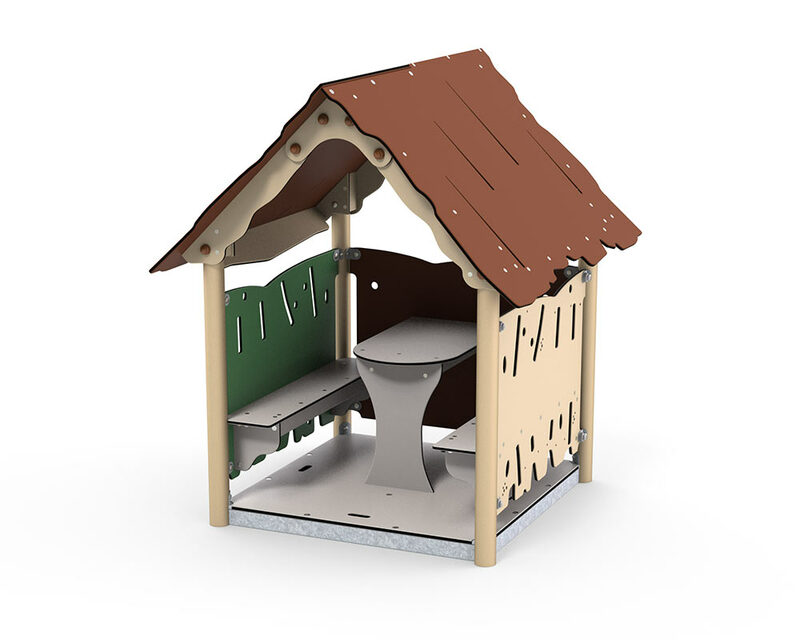 Ana is a standard playhouse with two benches and a table. Playhouses often provide a good setting for the role-play which is so important for children’s development. In conjunction with role-playing, children explore different possibilities, they learn social rules and how to compromise, and they learn how to negotiate and resolve conflicts. Role-playing also requires collaboration and communication. When children play in the playhouse, they exchange thoughts and words with themselves and each other. Initially, the youngest children will say a few words like “car, house, Mummy, hello, goodbye”. As the child gets older, it will say small sentences and announcements, which will develop the play: “Then that happened, and then we did this, and now we’re going to school” etc. The language helps to develop an understanding of the outside world and enables children to express emotions and communicate with other children. The playhouse’s floors are designed with a specially developed non-slip cubit-grain surface, and so the playhouse does not require a safety surface, and can therefore stand on grass.